Imaging a deep space object in LRGB and in narrowband tends to produce two very different images. In LRGB, we ascertain a measure of the target's true colour and in narrowband, a false colour image gives rise to tons of fine detail related to particular elements present. No doubt however, there comes a time when you would like to combine this broadband (LRGB) and narrowband data together, to get the best of both worlds. Some stunning images have been produced by astrophotographers doing this. 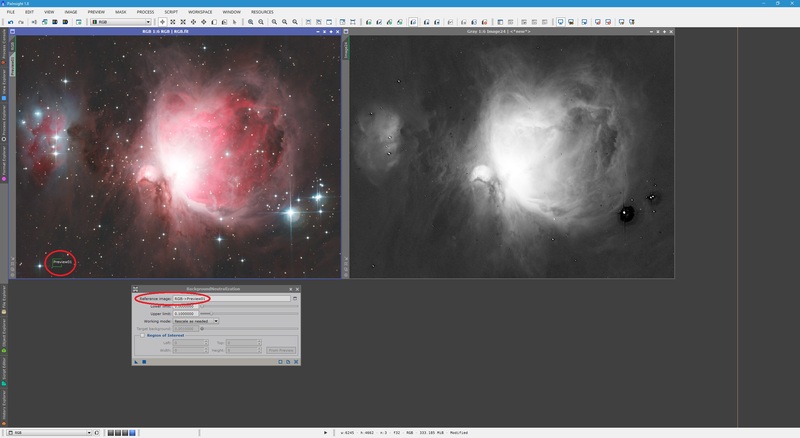 Generally, due to their wavelengths, Hydrogen-Alpha is used to enhance the Red channel of an LRGB image whereas because Oxygen-III is in-between green and blue, it is used to enhance both the Green and Blue channels of an LRGB image. One may however simply endeavour to enhance the Red channel with Hydrogen-Alpha, such as is normal for an image of a galaxy (to further bring out the star formation regions along spiral arms). 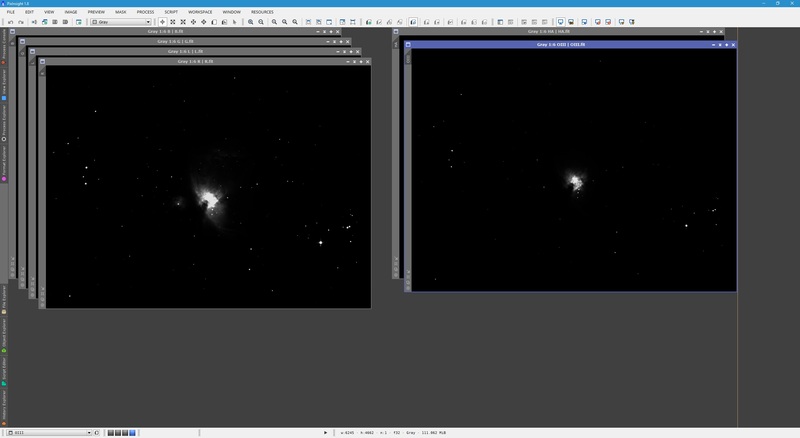 Narrowband data captured through filters other than Hydrogen-Alpha and Oxygen-III is not generally used to combine with LRGB data. 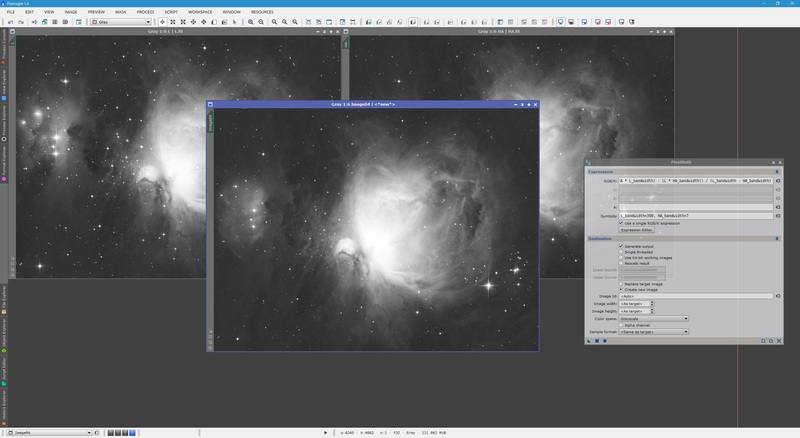 Some also choose to combine regular Luminance with the likes of Hydrogen-Alpha, for example. 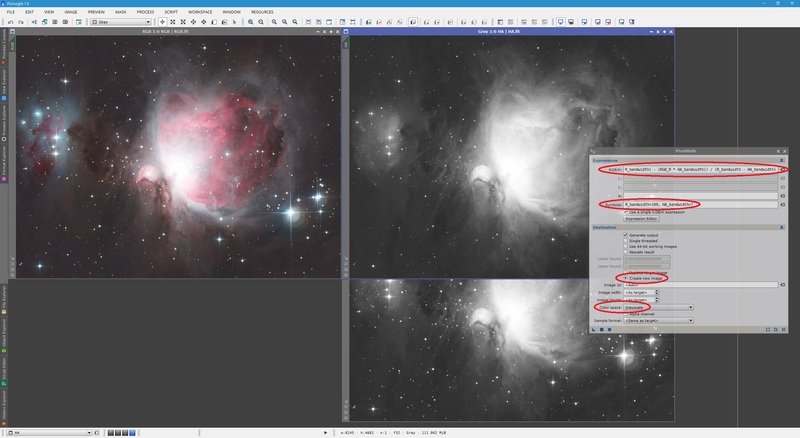 PixInsight is very capable of combining broadband (LRGB) and narrowband data together to produce enhanced images and the choice of which channel(s) to enhance, is totally up to the user. 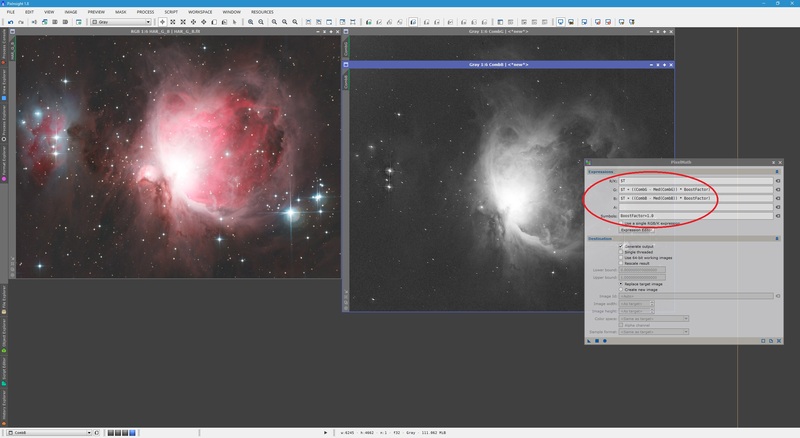 This tutorial goes over the common ways in which narrowband data is used to enhance an LRGB image - Hydrogen-Alpha for Red, Oxygen-III for Green and Blue and Hydrogen-Alpha for Luminance. The method for all these combinations is based on one by Vicent Peris of the PixInsight team. Your images have all been registered with each other, have been cropped by the same amount and have had background gradients removed (read this, sections 1, 2 and 3). ​​The images that will be used for this tutorial have been fully pre-processed, have been registered to each other, have had their black edges cropped out using DynamicCrop and have had background gradients removed using DynamicBackgroundExtraction​. The monochrome LRGB images have also been matched in brightness with the Green image as reference using LinearFit​. All this is typical of preparations done to images prior to colour-combination and further post-processing, and is strongly recommended before proceeding. The images are all still in their linear state, shown below. ​​We begin by colour-combining the Red, Green and Blue images into a colour RGB image. This colour RGB image is then colour-calibrated so it represents the true colour of the target. 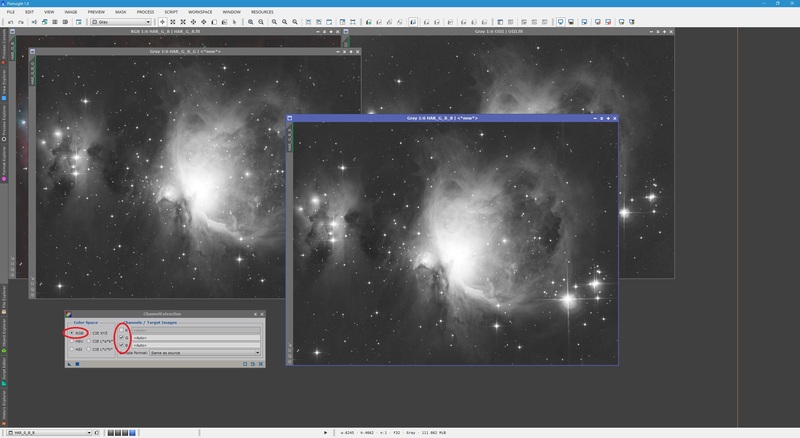 The procedures for this are beyond the scope of this tutorial as there are other tutorials based on these subjects (colour-combining and colour-calibrating images). It is however very important we colour-calibrate the colour RGB image before we venture into enhancing it with narrowband data. ​Above, the new colour RGB image has been autostretched for demonstration purposes. The monochrome Red, Green and Blue images have been closed as we no longer need them (having colour-combined them and colour-calibrated the result). We now have everything we need to proceed. ​Given that the Hydrogen-Alpha emission line lies deep within the Red part of the spectrum, Hydrogen-Alpha is always used to enhance the Red channel alone. We start by opening the colour-calibrated colour RGB image we created earlier as well as the Hydrogen-Alpha​ image. These are shown below autostretched for demonstration purposes. 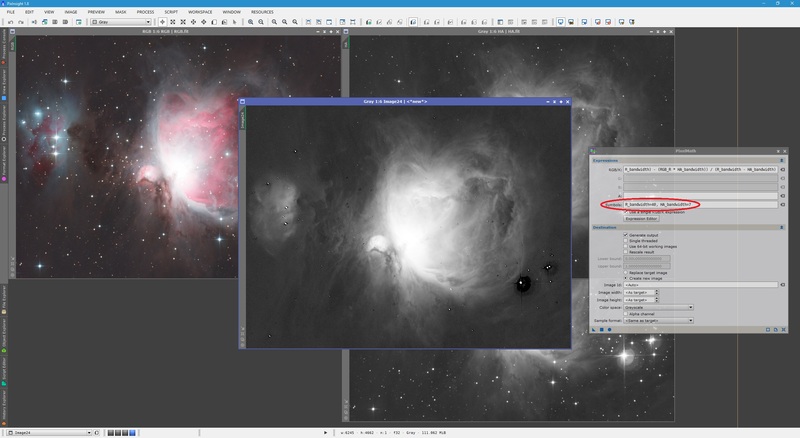 ​​In order to enhance the Red channel of the colour image with Hydrogen-Alpha, we first need to extract the Red channel out of it as a monochrome image. 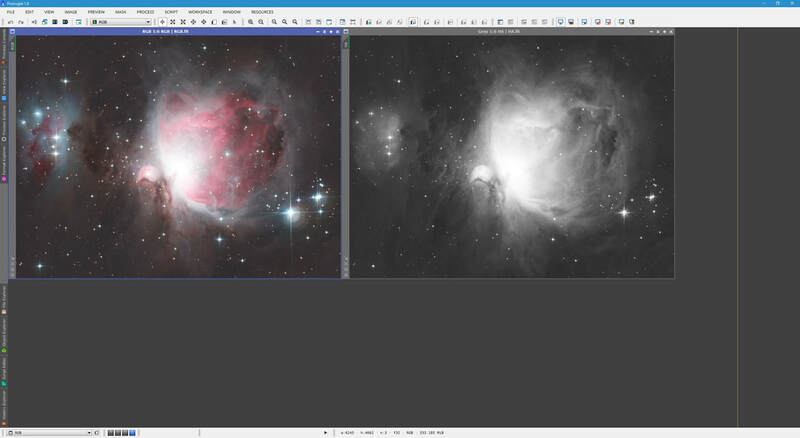 This is necessary because after colour-calibration, the individual colour channels have been altered in intensity relative to each other (in comparison to the original monochrome Red, Green and Blue images). For this, we use the ChannelExtraction process. In its default RGB mode selected under Color Space, only keep R selected under Channels / Target Images and Apply​ the process to the colour RGB image. Since my colour RGB image was simply named RGB, the new monochrome image that comes up is called RGB_R, which is the colour RGB image's Red channel. As the images are all in their linear state, by default, the extracted Red channel is also displayed in its linear state. We now open the PixelMath process, which we will use to carry out our Red channel enhancement with Hydrogen-Alpha​. ​​Since my Hydrogen-Alpha image is simply called HA, I left this as-is in the RGB/K text box. However, I changed R for RGB_R as this is the name of my extracted Red channel image. The numbers 100 and 7 correspond to the filter bandwidths in nanometres for the Red and Hydrogen-Alpha filters used during imaging of this target. Indeed most Red, Green and Blue filters have a bandwidth of about 100nm whereas narrowband filters vary. This image was captured using a Baader Hydrogen-Alpha 7nm filter so 7 is the correct value to enter for HA_bandwidth​. Clicking Apply on PixelMath creates a new image, shown below autostretched. Indeed there are less stars present in this new image, but there are still quite a few. To be more aggressive about their removal (and indeed other continuum irrelevant to the combination), we simply decrease the value entered for R_bandwidth. At present, it is 100. Lowering this to 40 yields a much better end result. We can close the image created earlier without saving and check out the new combination with R_bandwidth set to 40​. ​The fact that stars are pretty much gone means they will retain their natural colours despite the enhancement of the Red channel with Hydrogen-Alpha​. For an image of a galaxy, tweaking R_bandwidth will effectively remove not only stars, but also the continuum of the rest of the galaxy structure, leaving behind only the regions that actually would be enhanced by Hydrogen-Alpha. With the new combined image created, we will use this to actually enhance the Red channel of the colour RGB image. 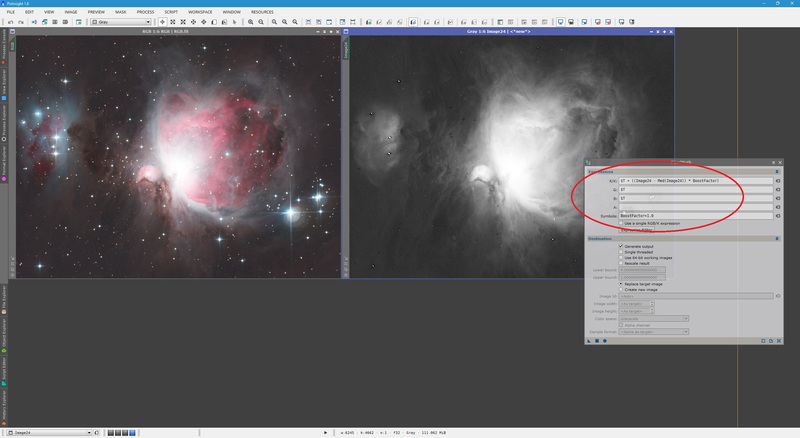 Before we proceed, we click Reset on PixelMath and close the extracted Red channel image as well as the original Hydrogen-Alpha image. We therefore only keep the colour RGB image and the newly created image open. Above, I have replaced CombImg with the actual name of my combined image, Image24​. The expression on the R/K text box will essentially add the combined data into the Red channel of the colour RGB image. Having $T in both the G and B text boxes ensures the Green and Blue channels are kept as-is, without alteration. The BoostFactor parameter simply scales how strongly to enhance the Red channel by the Hydrogen-Alpha data. 1.0 will naturally add in what is already there, whereas values below 1.0 will enhance the Red channel less and values above 1.0 will enhance the Red channel more. In order to carry out the enhancement, simply select the colour RGB image and click the Apply button in PixelMath or drag and drop PixelMath's New Instance​ button on to the colour RGB image. ​Clearly the enhancement has worked, as the reds are more vivid and there is more nebulosity visible towards the outer surrounding areas. In order to finish the enhancement however, we will need to neutralise the background in the enhanced image. 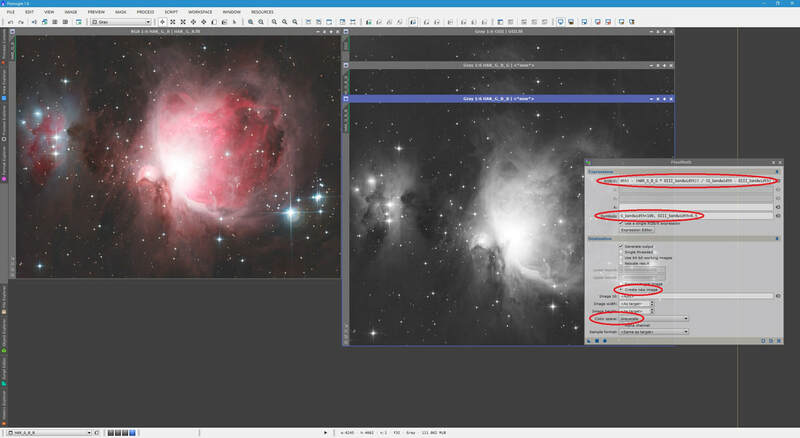 For this, we create a small preview box over just background space (no nebulosity or stars), open the BackgroundNeutralization process, select the preview box from the list under Reference image and Apply it to the ​colour RGB image. Re-applying the autostretch yields the changed result. ​The result now looks much better. 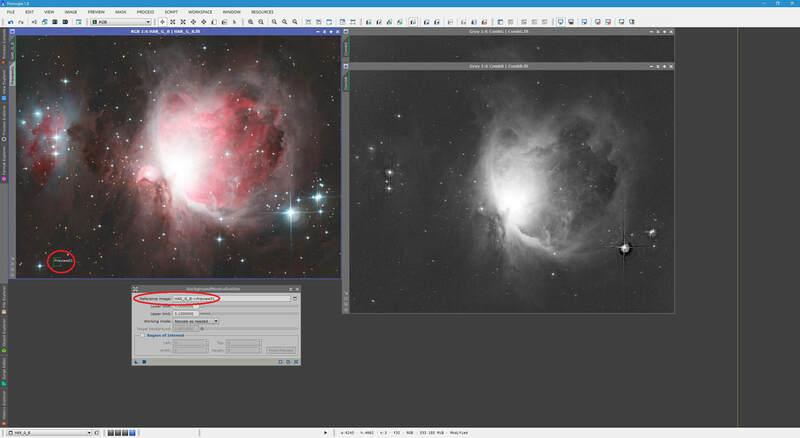 Please keep in mind there is no sense in using the ColorCalibration process now as it will undo much of our enhancement of the Red channel with Hydrogen-Alpha. BackgroundNeutralization is all we require. 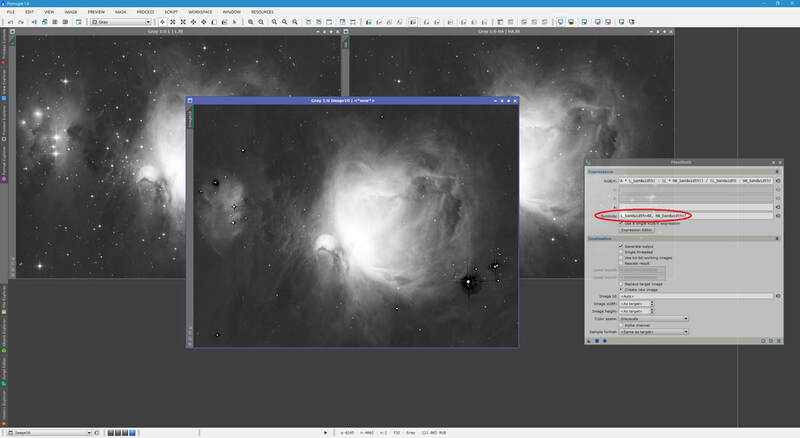 At this point, if you are happy with your result, you can close the combined image we created earlier (mine is called Image24), delete the preview box and save changes to your colour RGB image. If you would like to enhance the Red channel more (or less), simply undo the changes made to the colour RGB image, tweak the BoostFactor value in PixelMath and simply re-Apply the process and redo BackgroundNeutralization​. ​​Since the Oxygen-III emission line lies in-between the green and blue parts of the spectrum, Oxygen-III is usually used to enhance both the Green and Blue channels of a colour image. We will proceed to do this, continuing from where we left off (after enhancing the Red channel with Hydrogen-Alpha​). Below we have our Hydrogen-Alpha-enhanced colour image as well as the Oxygen-III​ image, both autostretched. ​​The procedure we will follow is identical, but is applicable to the Green and Blue channels in this case. We therefore use the ChannelExtraction process in its default RGB mode selected under Color Space, with only G and B selected under Channels / Target Images​. We click Apply with the colour image selected. ​Above, I have replaced G with the actual name of my extracted Green channel image - HAR_G_B_G​. The numbers entered for G_bandwidth and OIII_bandwidth again correspond to the filter bandwidths in nanometres. We can again start by saying G_bandwidth is 100 whereas the OIII_bandwidth value is set to 8.5 as the filter used to capture this image was a Baader Oxygen-III 8.5nm​ filter. When ready, we click Apply in PixelMath to create a newly combined image of Green and Oxygen-III. ​​As before, we can remove more stars and continuum simply by decreasing the value for G_bandwidth. In this case however, 40 was far too low and removed a lot of nebulosity to the left of the image in particular. A much better end result was achieved with a G_bandwidth value of 60​. ​Above, I changed B for HAR_G_B_B - the name of my extracted Blue channel image. Again, some experimentation with the value set for B_bandwidth yielded the best result for a value of 70. ​With another satisfactory result created, we rename this new image CombB, set it aside and close the extracted Green and Blue channel images, close the original Oxygen-III image and click the Reset button in PixelMath. ​​CombG and CombB correspond to my combined Green and Blue image names. Yours may differ so alter the PixelMath expressions accordingly. As before, we simply need to Apply the PixelMath process to the color image by first selecting the image and then clicking Apply​ (or drag and drop PixelMath's New Instance button on to the colour image). Below shows a before and after comparison of the colour image. 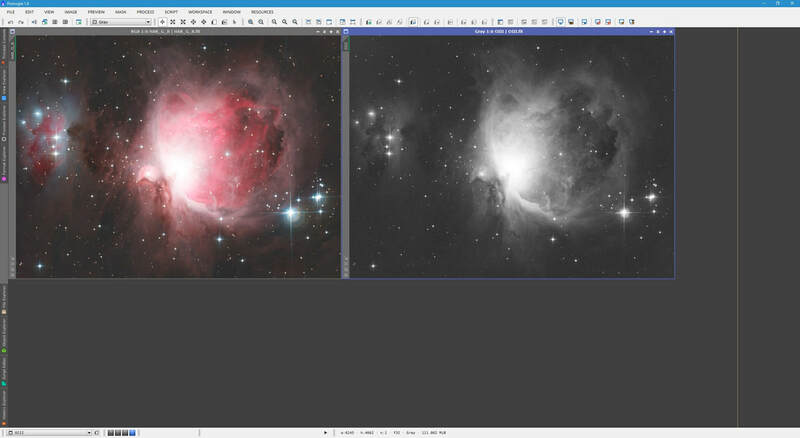 The left image is before and the right image is after (Hydrogen-Alpha and Oxygen-III enhanced). ​​Remember that the amount of enhancement provided can be tweaked with the BoostFactor parameter in each step. The colour image is still linear at this stage, allowing the user to keep post-processing further as they normally would. The colour image could be post-processed on its own or later combined with a Luminance​ image, post-processed separately. ​​At times, we want to ensure Luminance has a contribution from narrowband data as well. Even if we do not bother enhancing the Red channel with Hydrogen-Alpha, combining Luminance with Hydrogen-Alpha provides extra luminous contribution of the Hydrogen-Alpha nebulous regions. 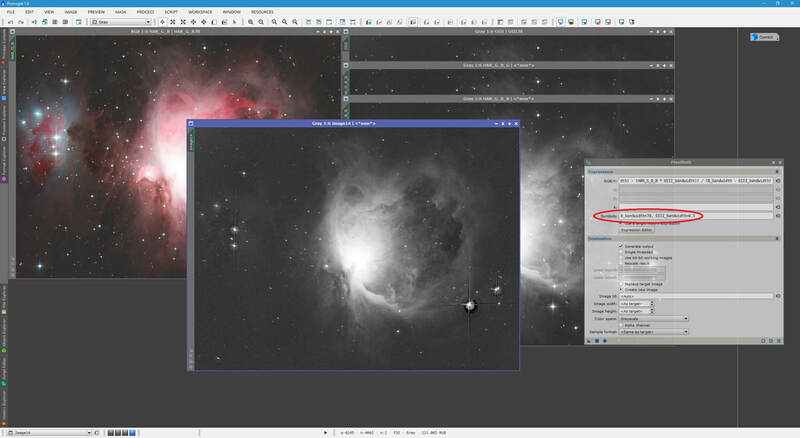 This means that when combining the enhanced Luminance image with a colour image later in post-processing, the Hydrogen-Alpha emissions are further brought out and brightened. The main reason for doing this solely with Hydrogen-Alpha is the fact that most of the visible Universe is Hydrogen, meaning a Hydrogen-Alpha filter will almost always produce the greatest amount of data and thus provide the greatest contribution. Since the Luminance image is naturally monochrome as-is, we do not need to extract anything. We simply open our Luminance and Hydrogen-Alpha images, as shown below autostretched. 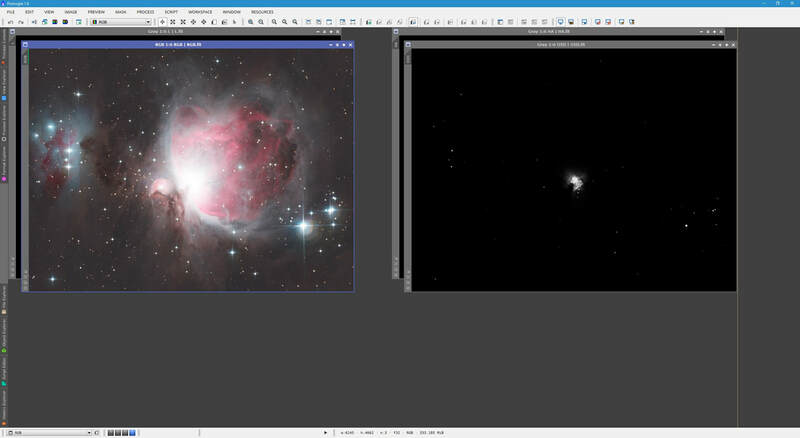 ​​Since my Luminance and Hydrogen-Alpha images are called L and HA respectively, I keep these as they are. Note that because the bandwidth of a Red, Green or Blue filter is about 100nm, that the bandwidth of a Luminance filter is therefore about 300nm, hence why we enter 300 for L_bandwidth. Again, as this image was captured using a Baader Hydrogen-Alpha 7nm filter, we enter 7 for HA_bandwidth​. We click Apply in PixelMath and our new image comes up, shown below autostretched. ​We again wish to produce an image at this stage that leaves out most stars and continuum. As you may expect, we simply have to tweak the value for L_bandwidth until we achieve a good result. In my case, 40 was actually a much better value. Do not worry about setting such a low value for Luminance​ - as long as you get a result like the one below, it will work well. 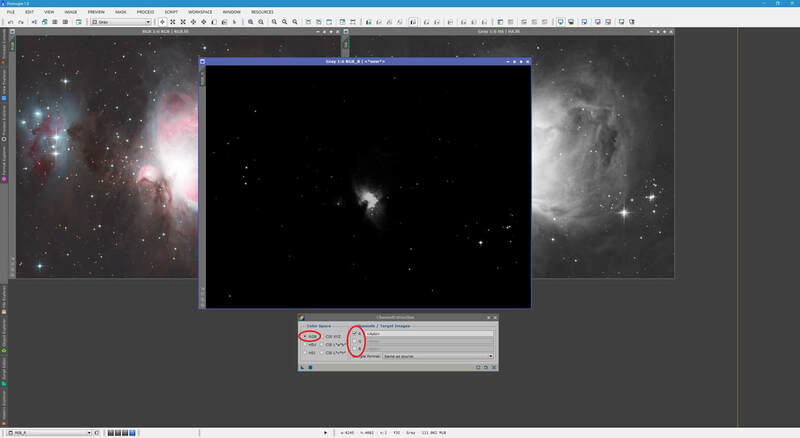 Above, I altered CombImg to Image10, the name of my newly created image. ​​In order to perform the enhancement, we simply click Apply in PixelMath while the Luminance image is selected, or we drag and drop PixelMath's New Instance button on to the Luminance ​image. 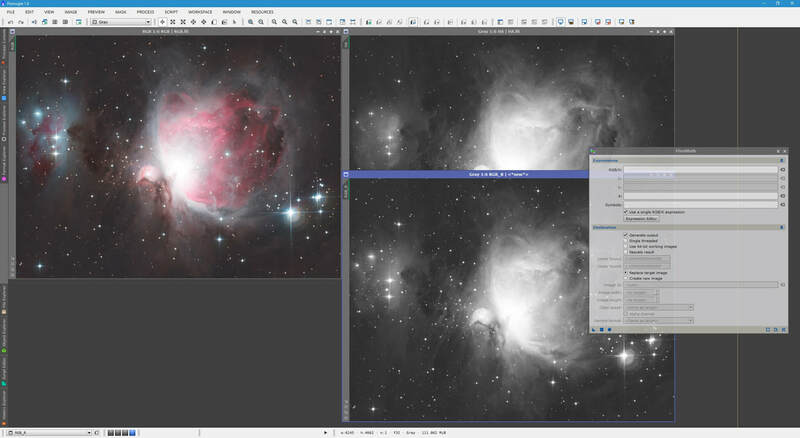 Re-applying the autostretch will be necessary to see the enhanced Luminance image as it actually is. ​​The resulting enhancement is very clear as a lot of faint surrounding nebulosity is brought out and brightened. Bright nebulosity is also further contrast-enhanced. Again, the parameter BoostFactor​ plays a major role in how much enhancement is applied. At this point, if you are happy with your result, you can close the combined image we created earlier (mine is called Image10​) and save changes to your Luminance image. If you would like to enhance the Luminance image more (or less), simply undo the changes made, tweak the BoostFactor value in PixelMath and simply re-Apply the process. Belows shows a before and after comparison of the Luminance image. The left image is before and the right image is after (Hydrogen-Alpha enhanced with a BoostFactor value of 0.75​). ​​Obviously in targets where there are not such bright areas such as this nebula's core, the effect is even more pronounced and beneficial. We can clearly see the benefit along the surrounding faint areas, however. 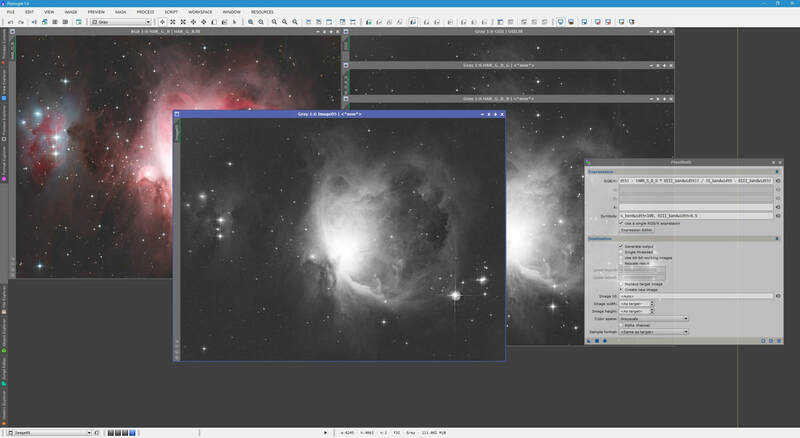 The enhanced Luminance image can be post-processed on its own for later combining with a colour image, whether or not that colour image has also been enhanced with narrowband data.